Although Steinbeck’s work is quite brief, you can unpack so much in those six chapters. With the use of my guided notes set, I hope to help you and your students an opportunity to find those significant elements as well. 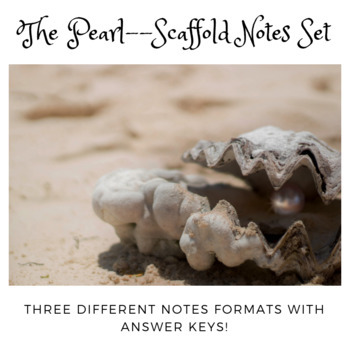 Included in this 19-page product are three different notes sets with answer keys. Each set of scaffold notes provide a unique way to approach the content of the chapters. The content covered in the notes are applicable to my other Pearl products as well. Check out the links below to those products to finish out your novel instruction. If you like the product above, check out my store for other scaffold notes formats from short stories and poetry to nonfiction and novels.